U.S. President Donald Trump has reportedly signed a new executive order, creating a council meant to "transform and modernize" government IT systems. 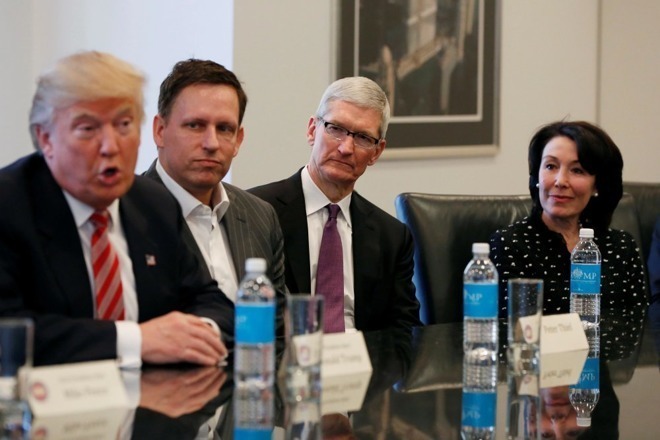 Simultaneously, the White House revealed a series of meetings in June, during which some 20 high-tech CEOs —likely including Apple's Tim Cook —will be brought in to discuss the topic. "Americans deserve better digital services from their Government. To effectuate this policy, the federal government must transform and modernize its information technology and how it uses and delivers digital services," the order reads. Reuters noted that the order is dated April 28, but was only announced on Monday. Cook's participation in the June meetings is unconfirmed, but the CEO has previously met with Trump and his senior advisor, son-in-law Jared Kushner. In March Kushner was appointed to head a White House group called the Office of American Innovation. Cook is allegedly one of the corporate advisors to the group, some others being former Microsoft chief Bill Gates, and Tesla/SpaceX CEO Elon Musk. The Office's mission is to overhaul federal bureaucracy, possibly even handing some services over to the private sector. Cook has been a vocal critic of Trump, singling out his policies on women, immigration, transgender rights and more. At the same time he has defended his involvement with the Trump administration, saying he can wield more influence that way than by "being on the sideline." Apple could potentially reap a windfall if the government decides to adopt its products or at least better support them.